Considered one of the modern founders of the Italian fashion industry, Roberto Capucci’s eclectic style is a mix of colours, materials, shapes, textures, and ideas. Indeed, Capucci was more than just a fashion designer, he was an architect, a visionary and, above all, an artist. Capucci was born Italy’s capital city, Rome, where he opened his first couture studio, though he has always been closely associated with Florence. His first great success occurred right here, along the banks of the Arno, where he held his debut fashion show in 1951 in Palazzo Pitti’s “Sala Bianca”. Thanks his unusual haute couture creations and style, Capucci caught the world’s attention, and just a few years later he was named Italy’s top fashion designer, winning the “Oscar for Fashion” in 1958 by top retail chain, Filene’s of Boston. 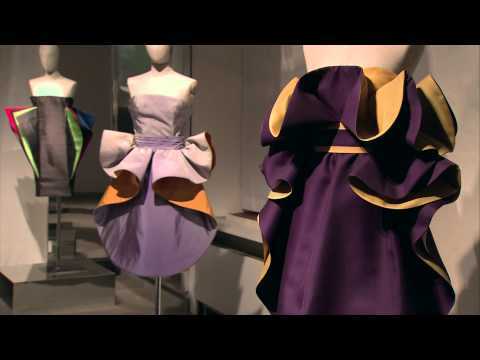 Florence is home to the Roberto Capucci Foundation, which is aimed at preserving and promoting Capucci and his work, as well as encouraging new ideas of style, design and top-quality craftsmanship in the Italian and international fashion worlds. The foundation also comprises the Capucci archives and a museum. Located on the fourth floor of Villa Bardini, the Capucci Museum offers a selection of the incredibly complex “sculpture dresses” that seem to defy gravity. Th exhibition currently running, Variations on a creative theme: swirls and curls, plissè and geometric lines, is testament to Capucci’s unique style. Showcasing 23 garments and their sketches, the show illustrates the designer’s extravagant, sculptural garments that are inspired by art, geometry and nature. Centrepiece of the exhibition is the “Bride in red”, a creation made in 2009 of a very special and unique fabric, called mikado. The dress was presented for the first time in Venice in March 2009 in occasion of the exhibition “Roberto Capucci at Palazzo Fortuny”. Capucci’s innovative, geometrical designs are found not only at Florence’s Villa Bardini but in the world’s greatest fashion museums, including in Costume Gallery in Palazzo Pitti.